XMMS in Jaunty Jackalope 9.04: How to install with codecs. Many have decried the removal of XMMS from the Ubuntu repositories – it has been absent since Gutsy – despite it being the preferred music player for a lot of people and remains the only media player that – to my knowledge – can handle 30-40k+ collections. Not only is it the only player capable of very large collections, it also handles such collections with very little resource use. It’s the canine’s testicles, mate! The colonos blog has provided some detailed explanations for installing XMMS in Intrepid (see this entry for an overview) and now the time has come for installing XMMS in Jaunty Jackalope, also known as Ubuntu 9.04. This entry was posted in Free Software, ubuntu and tagged jaunty jackalope xmms, jaunty xmms, music player jaunty, xmms flac, xmms in ubuntu 9.04, xmms-mp4, xmms-wma. All you need to be able get XMMS up and running in Intrepid (or Hardy), incl. FLAC, WMA, mp4, can be found in this zipped file. If you need information about how to use it, look here, here, and here. 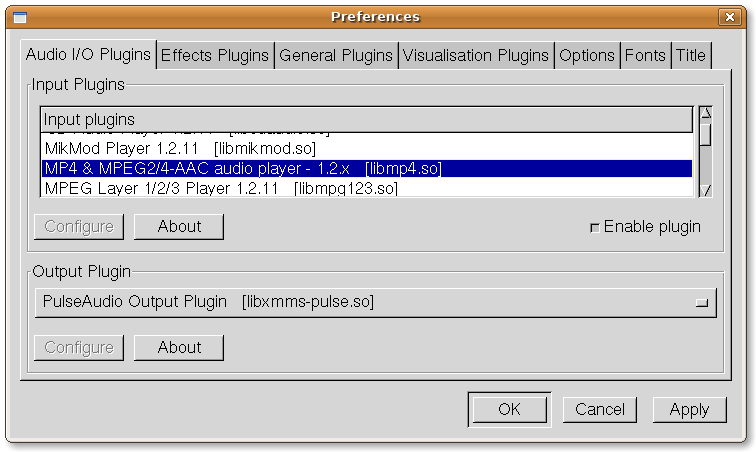 So now I have XMMS running in Intrepid with all needed plugins – wouldn’t it just be nice if the olden golden player came back into the repos? This entry was posted in Free Software, ubuntu and tagged i, xmms .deb intrepid, xmms flac, xmms in intrepid, xmms in ubuntu, xmms-wma, xmms_1.2.11-1_i386.deb. In some foreign language there is an expression that goes, more or less, like this: “Don’t cross the river for water“, since often times you can find what you’re looking for, if you could only see the wood for all the tress, in a different manner of speaking, as it were. So what’s the point of all of this? This entry was posted in Free Software, ubuntu and tagged compile plugins xmms, xmms, xmms .deb intrepid, xmms flac, xmms icon, xmms in intrepid, xmms ubuntu 8.10, xmms-mp4, xmms-wma.